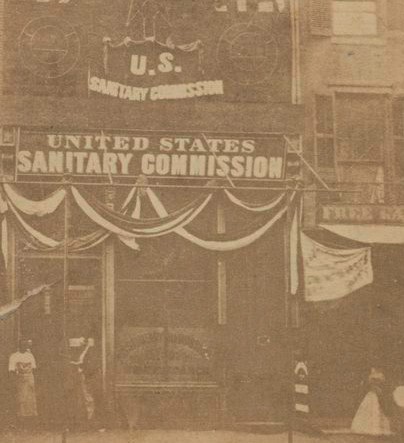 The block recalls the founding of the Sanitary Commission. 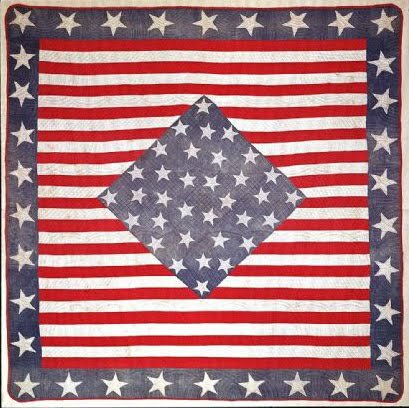 If you see a shadow of a red cross it's because the Sanitary Commission preceded the Red Cross as an organization to aid sick and wounded soldiers. 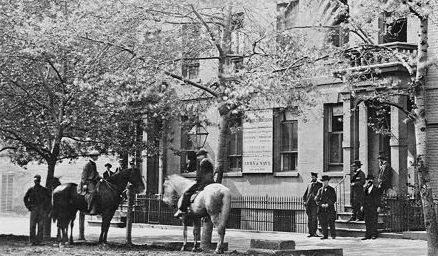 150 years ago this week the Union government recognized the United States Sanitary Commission, authorizing the civilian group to take responsibility for soldiers' hospitals and medical care. It surprises us today to realize that governments took little responsibility for war wounded. 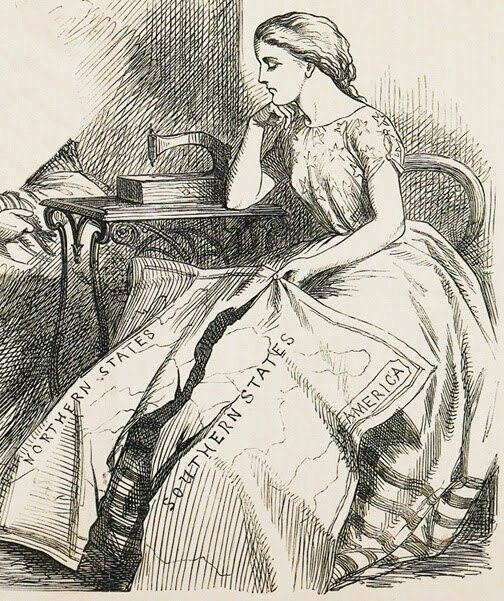 In Europe's Crimean War of the 1850s Florence Nightingale established a civilian mission that saved many lives. Inspired by Nightingale's work, the first Sanitary Commission grew from the work of New York's Woman's Central Association of Relief. Women were officers as well as nurses in the Sanitary Commission. Here a group visits a battlefield. Cities all over the Union soon volunteered to organize local Sanitary Commissions. One of their major duties was collecting blankets, medical supplies, food and clothing for hospitalized soldiers. 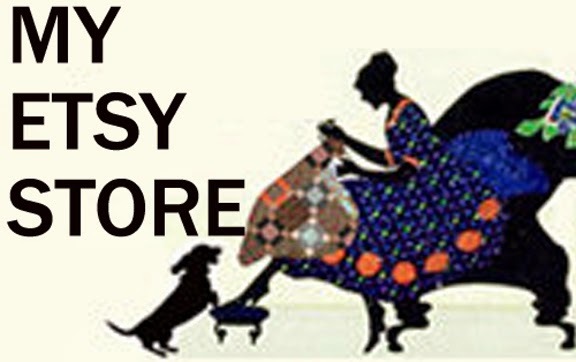 Another was sewing those blankets, supplies and clothing in numerous Ladies' Aid Societies. 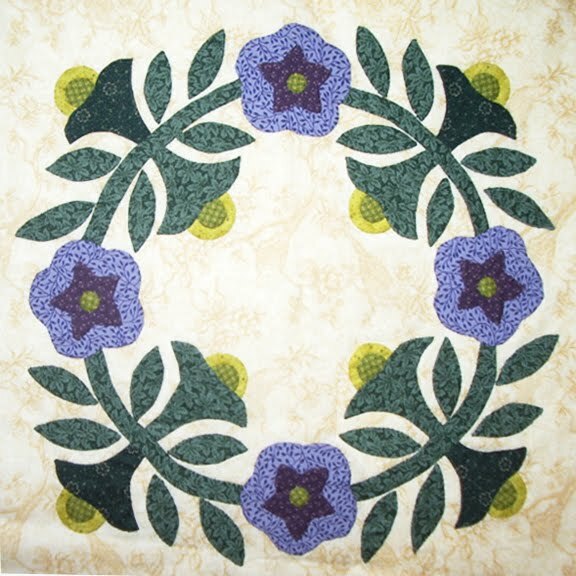 In 1863 Mrs. R. H. Hook wrote a flowery letter about the work of the Sanitary Commission, using a patchwork quilt as a metaphor to discuss the sacrifices of Union women. "They have given their husbands, their sons, their lovers and brothers.... 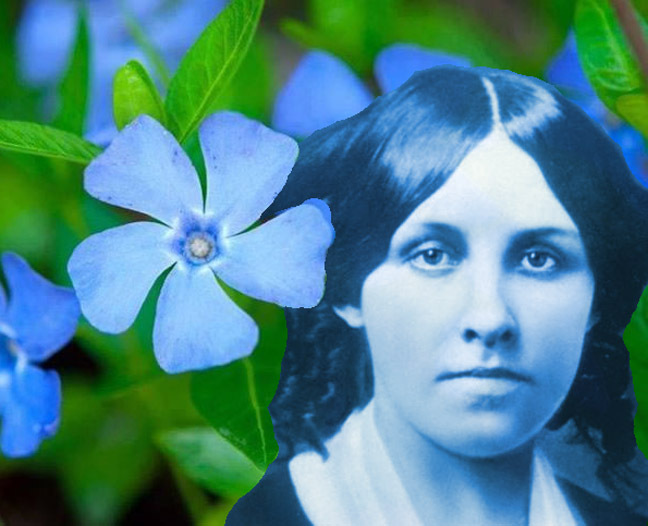 This passion, not content with giving up the bread-winners, the pride and joy and stay of their homes, has led the women of the land to take the snowy quilts and blankets from their beds, the curtains from their windows, the hoarded linen from their presses, and send it in avalanches of comfort to our storehouses of relief. 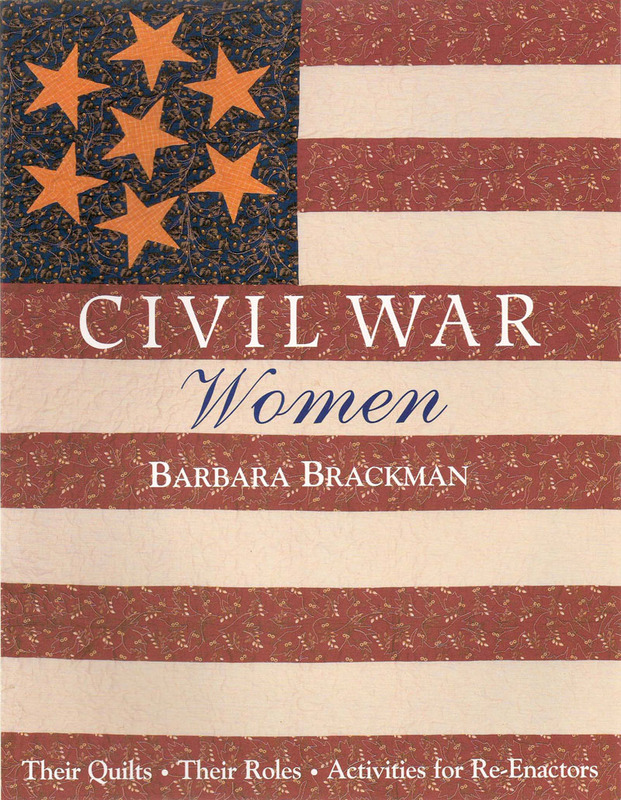 The women have considered themselves as at a great national quilting-party; the States so many patches, each of its own color or stuff, the boundaries of the nation the frame of the work; and at it they have gone, with needles and busy fingers, and their very heart-strings for thread, and sewed and sewed away, adding square to square, and row to row; allowing no piece or part to escape their plan of Union; until the territorial area of the loyal States is all of apiece, first tacked and basted, then sewed and stitched by women's hands, wet often with women's tears, and woven in with women's prayers; and now at length you might truly say the National Quilt—all striped and starred—will tear anywhere sooner than in the seams, which they have joined in a blessed and inseparable unity!" to be shipped to battlefield hospitals. Those barrels held many patchwork quilts. 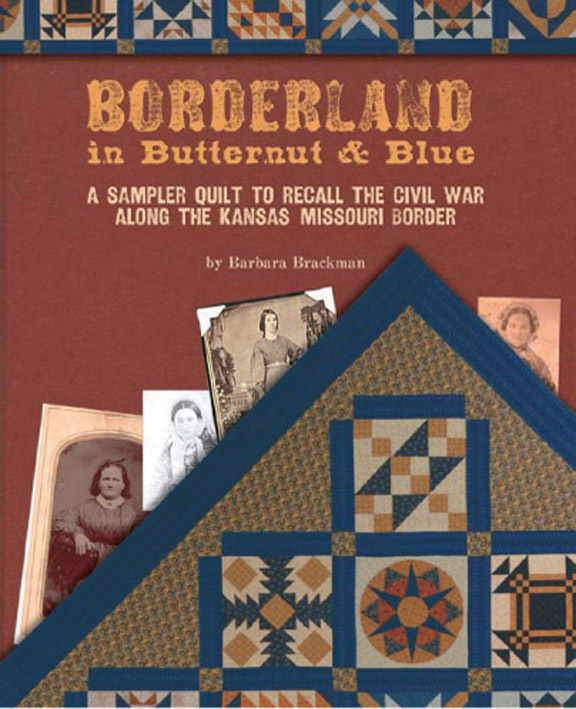 The Ladies Aid Album block (BlockBase #1719) was published in the Kansas City Star in 1938. 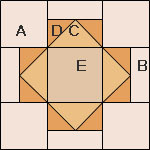 Here the design is redrawn to better fit an 8" block. 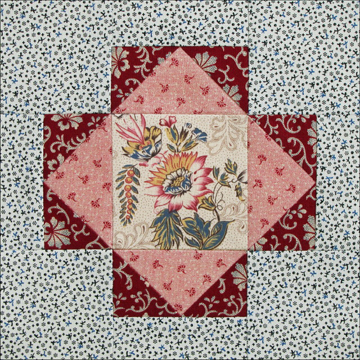 A Cut 4 light squares 3". B Cut 4 light rectangles 1-1/2" x 3-1/2". 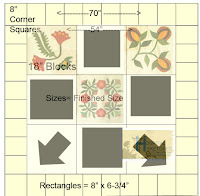 C Cut 1 medium square 4-1/4". Cut into 4 triangles with 2 cuts. You need 4 medium triangles. D Cut 4 red squares 2-3/8". 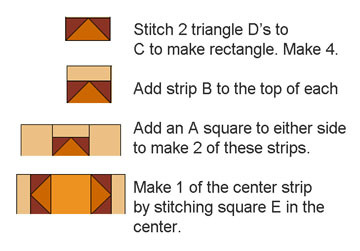 Cut into 2 triangles with 1 cut. You need 8 red triangles.E Cut 1 medium square 3-1/2"
Above is a report from the Northern Ohio Sanitary Commission on items received and then donated to hospitals. 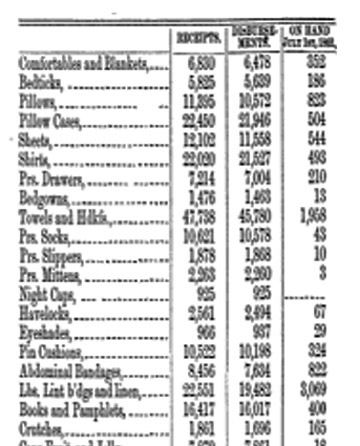 In Northern Ohio alone during the first year of the war the women took in nearly 6800 "comfortables and blankets." 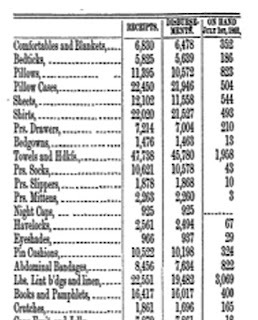 Very few of those bedcoverings returned from the war. 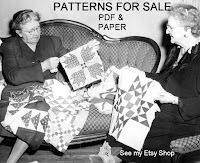 I would just like to say thanks for all of these patterns you are posting, your time and research ( which you love to do )I am from Australia but I love the history, well any history for that matter. Thanks again. You are wonderful for doing all this work. I will just be starting this week with my 13 yr old son. 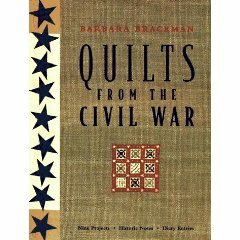 I am going to give him the little history lesson and then I will let him make his first ever quilt. But it may take us a while. Do you plan to leave this blog up much past the year in case it takes us a while? 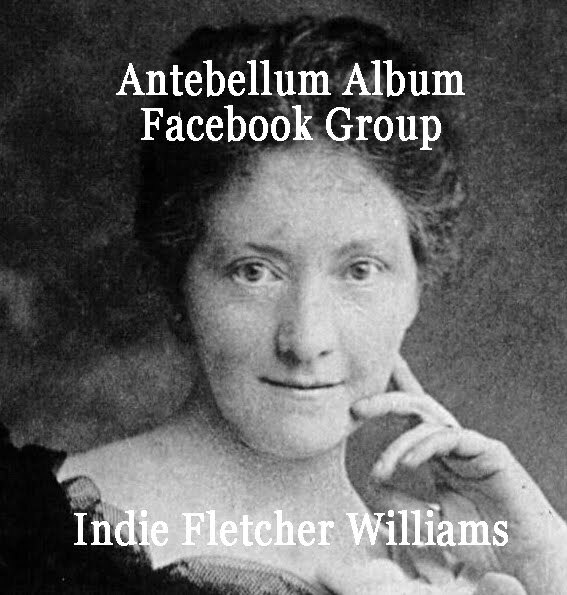 I'm a living historian and a member of the Michigan Soldiers' Aid Society, a group which existed during the war. 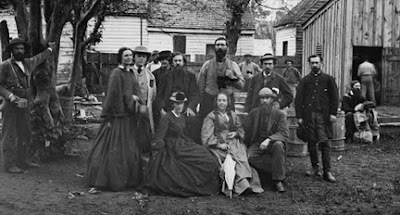 A less well known aspect of many aid society's was their role in supporting the families left at home - helping them deal with the loss of the sole breadwinner, dealing with governmental bureaucracy, assisting with arrangements to return a deceased or wounded relative home, etc. We attempt to portray the role of the civilian in the war, to show that the impact was felt far from the battlefield. Thank you for another awesome post! I wish I had found you sooner and was making the blocks with you. 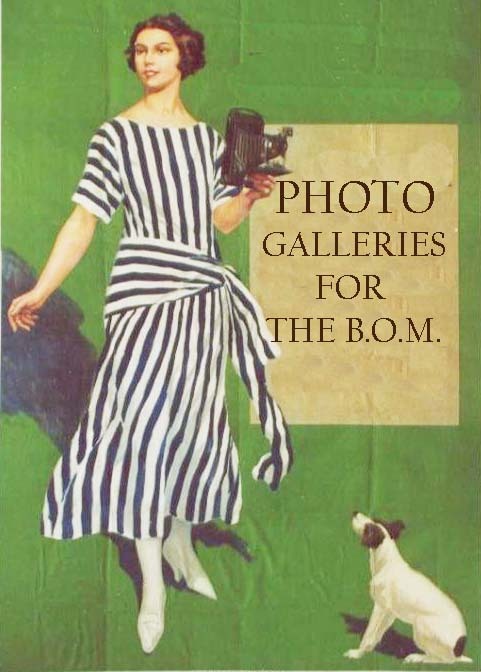 I hope you plan to leave this blog open forever, so when I have time I can start at the beginning and make one, too. 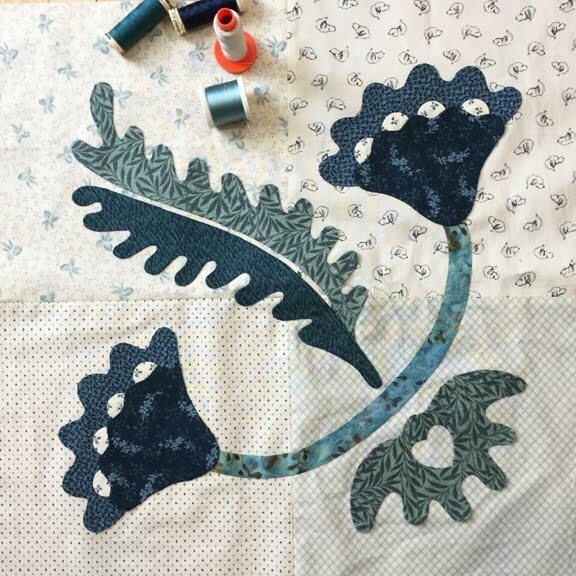 I am so enjoying this quilt along! 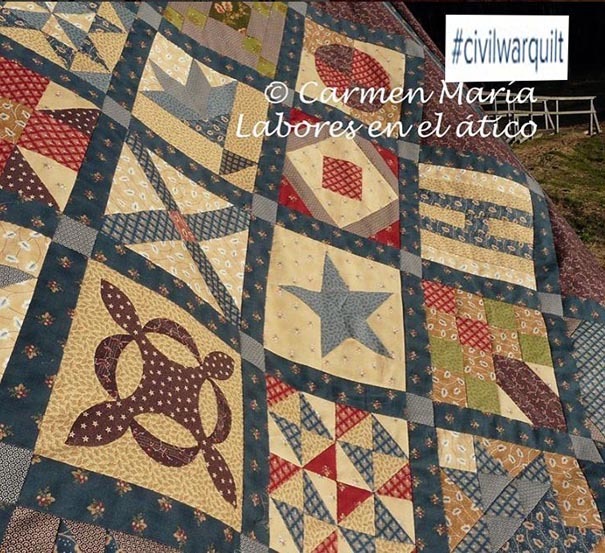 I absolutely LOVE The quote that uses the patchwork quilt as a metaphor to discuss the sacrifices of Union women. I just might use that quote on the label that I use for this quilt when I give it away to my very deserving sister and brother in law. 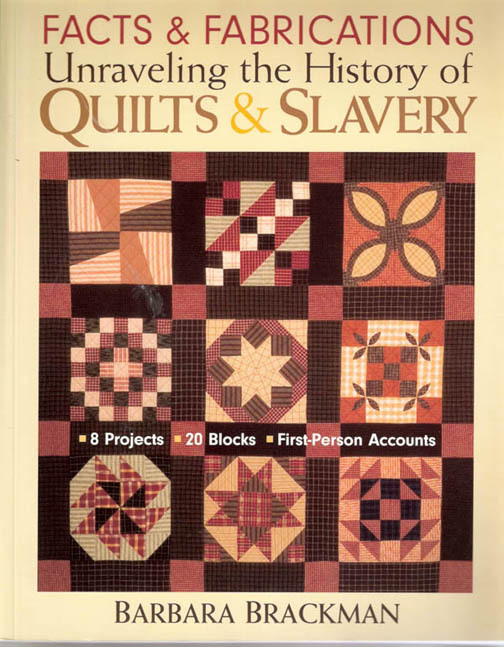 I agree with Quilting Yai Yai, I would like to see this left up so that we can pick up the blocks we missed along the way. I moved to the deep south three years ago, and so I'm loving the history too! Thank you for another wonderful history lesson, and a great block! 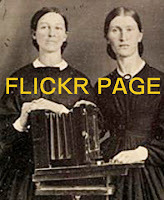 I'm sure that quote could also apply to the sacrifices of the women of the Confederacy - they certainly had a rough time! 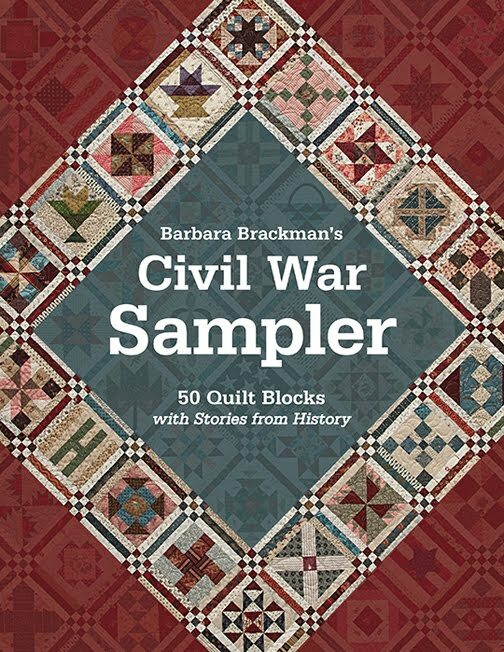 Barbara, i've been a regular visitor to your blog and i look forward to each week's civil war lesson not to mention drooling over each delightful block of the week. Another wonderful block and history lesson. 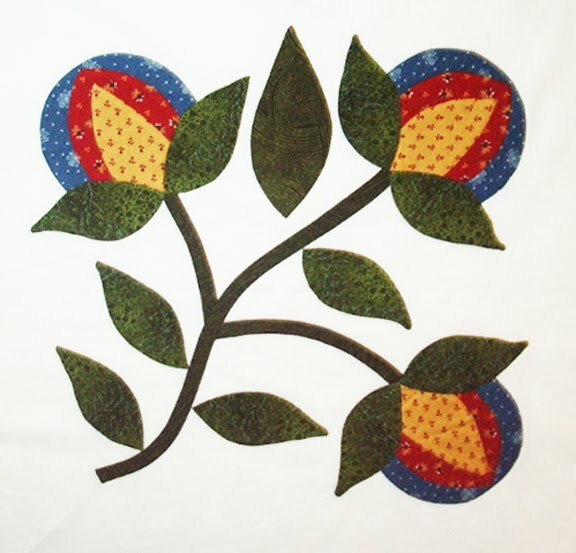 I have completed my block and posted it along with a how-to on my blog. Love reading all your research ...it is all so interesing. Thank you so much, I am so pleased with my blocks thus far, I look forward to each addition. Again, thank you, this has been a project that I look forward to and enjoy!